Ukraine’s Foreign Minister has said that six of his country’s citizens were killed in the Saturday siege of Kabul’s Intercontinental Hotel by the Taliban. “I have informed the president of the death of six Ukrainian citizens as the result of the attack on the hotel in Kabul. We are working with the law-enforcement agencies of Afghanistan to clarify the circumstances of this terrorist act.” Pavlo Klimkin on Sunday. Eighteen people, including 14 foreigners, were killed in the Saturday attack, according to Afghanistan’s Interior Ministry. An Afghan official says that at least 18 people, including 14 foreigners, have been killed when the Taliban attacked the Intercontinental Hotel in Afghanistan’s capital, Kabul. Spokesman for the Interior Ministry Najib Danish said that 11 of the 14 foreigners killed were employees of KamAir, a private Afghan airline. He added that 10 others were wounded including six security offiers and four civilians. KamAir also put out an announcement saying some of their flights were disrupted because of the attack. Ukraine says one of its citizens was killed in the attack on the Intercontinental Hotel in Afghanistan’s capital. Afghan officials say insurgents killed at least six people, including one foreigner, in an assault on the luxury hotel that began late Saturday and set off clashes with security forces that lasted more than 13 hours. They have not identified the foreigner, and the toll could rise as authorities survey the damage. Vasyl Kyrylych, a spokesman for the Ukrainian Foreign Ministry, announced the death in a brief statement on Twitter, without providing further details. An Afghan official says an assault on the Intercontinental Hotel in Kabul has ended after more than 12 hours with all the attackers killed by security forces. The Taliban claimed the attack, which began late Saturday, saying five gunmen armed with suicide vests targeted foreigners and Afghan officials. Interior Ministry spokesman Najib Danish said the last attacker was killed Sunday afternoon, more than 12 hours after the attack began. He says the attack killed six people, including a foreigner and a telecommunications official from the western Farah province who was attending a conference. 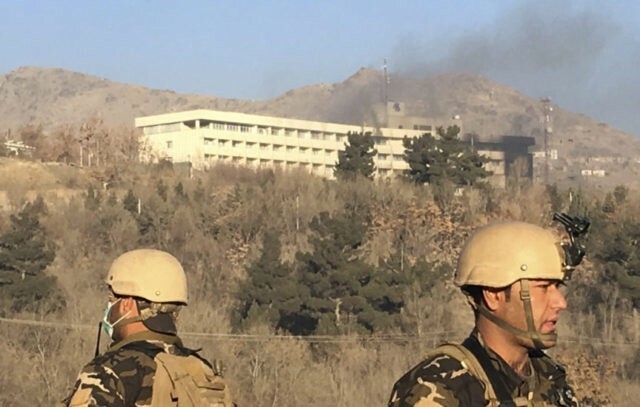 Six others, including three security forces, were wounded in the attack on the heavily guarded luxury hotel popular with foreigners and Afghan officials. Taliban spokesman Zabihullah Mujahid said the insurgents initially planned to attack the hotel Thursday night but postponed the assault because there was a wedding underway and they wanted to avoid civilian casualties. An Afghan official says a roadside bomb has killed at least 12 civilians in the western Herat province. Abdul Ahad Walizada, a spokesman for the provincial police chief, says a 13th person was wounded in the explosion early Sunday, which struck a vehicle in the Gulran district. No one immediately claimed responsibility for the attack, but Walizada blamed Taliban insurgents, who often plant roadside bombs to target Afghan security forces. An Afghan official says insurgents have killed 18 members of a pro-government militia in northern Afghanistan, in an attack claimed by the Taliban. Gen. Abdul Razeq Qaderi, the deputy police chief of Balkh province, says the insurgents burst into a home where several members of the Local Uprising Forces were gathered late Saturday. He says the attackers led them outside and shot them dead. One of those killed was a tribal elder who served as the local police commander. The Local Uprising Forces operate under the Interior Ministry. Gen. Mahruf Folad, the police chief of the western Farah province, meanwhile said a roadside bomb killed a deputy police chief and wounded four other police early Sunday. An Afghan official says at least five civilians have been killed after gunmen stormed the Intercontinental Hotel in Kabul and have been fighting security forces for 11 hours into Sunday morning. Interior Ministry spokesman Najib Danish says six other civilians are reported to be wounded and more than 100 people, including 16 foreigners, have been rescued from the hotel. The bodies of four attackers have been recovered as security forces continued to clear the landmark hotel. Danish says security forces are going room-by-room to make sure all attackers have been accounted for. No one has immediately claimed responsibility for the attack, which started around 9 p.m. Saturday.